Japanese professional snowboarder Ayumu Hirano tells SI.com about how he spends his off-season, what it's like to be in the midst of the best season of his career and much more. In the context of the Japanese snowboarding influx we’ve seen in the last five years, Ayumu Hirano is to the halfpipe as Yuki Kadono is to the slopestyle discipline. 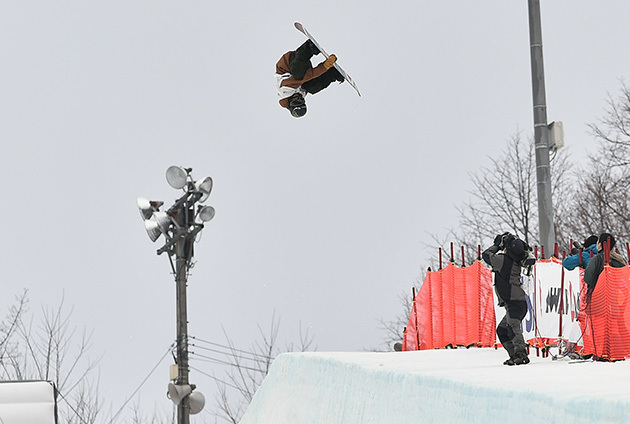 Hirano was dubbed a halfpipe phenom when he won a silver medal at the 2013 X Games at the young age of 14. He followed that performance up with a silver medal at the Sochi Winter Olympics the following season, making it clear that he was no flash in the pan. This season, at age 17, Hirano has made the jump to the center of the podium, earning victories at the LAAX European Open and X Games Oslo. SI.com recently spoke with Hirano (through translator Miles Atkinson) about his season, the key to his success, his loyalty to the run that he calls “the best of his life” and more. Ryan Wallerson: You won your first X Games gold medal in Oslo earlier this season. What was the key to your breakthrough? was to win this competition. I knew that I had to give my all in terms of effort and performance, but the event site is really the only place I’m able to practice the tricks that I want to bring to X Games. The days coming into Oslo I was practicing a lot of different tricks and working on a perfect routine. I worked on tricks that I’d thrown in other competitions, including X Games Aspen, some new ones I was still working on, and tricks that I hadn’t done in awhile. I worked on everything because I felt really good coming into Oslo but knew that I would need more variation that I’d had at other competitions in order to win. Throughout the contest, I had one routine that I kept working with and refining that had tricks from all three categories, and I was able to win with it. So the work paid off. RW: What was the winning run? AH: During the medal run in Oslo, I threw a Cab 1440, Frontside 540 Japan Grab, Backside 900 Melon Grab, Frontside Doublecork Truck Driver and my signature, the Switch Doublechuck. It’s the best run that I’ve ever had in my life. All of the most difficult tricks I’ve been working on came together in it. That was an awesome feeling. I’ve stuck to variations of that same run since I landed it. RW: You also won at LAAX this year, making it the most successful of your career thus far. What has the biggest difference been for you? AH: In contests today, the base run in halfpipe is two Doublecorks out of the four-to-six hits you get through the pipe, depending on the amplitude that you’re able to get. I didn’t want to follow that trend. Over the summer, I trained in New Zealand working on a new double, all throughout working with my coach Elijah [Teter] to see how I could keep pace with my competitors in a different way. The answer we came to was the Doublechuck, which I mastered over the summer. Adding that new trick this season has added a new dimension to my run and shows the progression of my riding. I think that’s been rewarded by the judges this season so far. AH: It’s tough to describe, but think almost like doing a double back flip with lots of style. Originally, I worked at first on mastering a single chuck. Eventually I got comfortable enough with it to add a second, and I think the second rotation makes all the difference in terms of keeping my runs on par with those featuring Doublecorks. RW: You and Yuki Kadono have both won major events this season. How does it feel to be a part of a successful winter season for Japanese riding? AH: Today, a lot of Japanese riders are consistently leaving great results at international competitions. In the past, there would be times that I did well, but Yuki didn’t do so well or Taku didn’t do so well, and vice versa. Lately, I’ve been traveling with Yuki and Taku to all of these different events and we’ve been staying together and spending a lot of time together. The bond between us has really grown. So of course I root for my fellow countrymen in other events if I don’t make it in halfpipe. But, at the same time, I’m competitive. I always want to beat my fellow riders, including of course my fellow countrymen. So we are friends and enemies at the same time. Rivals I suppose. Taku went on into the Burton U.S. Open finals and I did not. I rooted for him and wanted to see him win, but had I made it, things would have been different. Speaking of the Burton U.S. Open, you didn’t reach the finals, but I noticed your coach say something to you before your final run. What was the comment? AH: Well, I actually was happy with my riding in Burton U.S. Open qualifiers, but my runs didn’t seem to resonate with the judges. I landed my first run and got a score of 71, which we both thought was low for what I’d done. I wasn’t sure what the judges were looking for. It was a very similar run to the one I described in Oslo where I won gold. So we were talking about possibly switching up the routine, but I told him I wanted to stick with it because I believed in it. I had no reason not to, but it didn’t work out that time. RW: You’re an avid skateboarder as well. Which are you better at, skating street or snow of surf? Which have you been doing longer? AH: I started skating at the same time I started snowboarding, at age four. So it’s been nearly thirteen years for both, but if my snowboarding were rated a perfect 10, my skateboarding would probably be a 5. So I still have to work on my skating if I want to claim mastery of both practices. RW: Do you feel there is a relationship between your skating and your snowboarding? AH: There are a lot of things that I’m able to apply to my snowboarding and skateboarding. I am a vert rider in skateboarding, so it is essentially just another halfpipe. The main things that are basically the same are the drop in and pump timing. The drop in for skating and riding gives you the same scary rollercoaster drop feeling that keeps many people from doing it. You have to get past it just the same on either board. The pump in the pipe, the timing of when to go for more speed and momentum is also applicable to both sports. But in skating, there is no edge work. Hitting the lip of the vert ramp sends you straight up, where in snowboarding you have to focus on that moment more otherwise you end up outside of the pipe. That’s probably the biggest difference for me. Working on pump and amplitude in one will help me in the other, and my edge work is strong in skateboarding because of snowboarding. RW: Does your brother Eijyu have the edge on you in any of the three or are you still on top? AH: He might be better than me at skating at this point, since I’ve spent so much of my energy and focus on the slopes the last few years. But for that, I’m pretty confident that I’m the best snowboarder. At least I’d better be, or else one of them take my job! RW: How much time do you spend a year snowboarding? What do you do in the offseason? AH: I’m outside of Japan snowboarding for competition more than six months out of the year, but even in the off-season when I am home, I’m still working on my riding. I have a dry slope at home that allows me to continue honing my skills year round. I train on it weekly. If I’m giving myself downtime, it won’t be for more than two weeks, I’ll get be back at it, either abroad or on that dry slope. When I have that time off, I’m pretty lazy. I rest and spend time with friends. That’s really all. RW: Tell me more about this dry slope. AH: I don’t know exactly how tall it is; they are common in Japan and seem to have a regulated height for all the ones I’ve seen. It’s basically a kicker, a side jump, into an airbag that allows me to throw and maintain my smaller tricks. I certainly can’t Doublechuck off of it. RW: What is something that the world doesn’t know about Ayumu Hirano? AH: I’m very visual. My eyes are my instincts. If it doesn’t look good, I don’t mess with it. That goes for food, for animals—I hate bugs—basically anything that my mind decides doesn’t look straight up. That’s why you saw me freeze as that dog walked by as we were talking.